“Hell House” is another of the episodes on my iPod. Initially I loved the “monster of the week” storyline (and I always love it when ghosts aren’t simply ghosts) but it turned out to launch an arc of its own with the Ghost Facers. But why is this episode on my iPod so I can watch it over and over? I love the pranks, of course. I can just imagine young Sam and Dean driving John crazy with such things on the endless road trips of their youth. Can you picture Dean, in particular, sitting still for any extended period of time when he was a kid? Maybe that’s just the teacher in me who can just see that absolutely. And there’s the towel scene. Is “Hell House” one of your favorite episodes? What do you like best about it? Our countdown clock takes us to the very start of September 10th, and of course we have that whole day to wait, too...but we are officially well under three weeks until the season premiere! Woo hoo! I really want to stay spoiler free. It's nearly impossible, because if casting news or a Comic-Con report comes my way, I can't stop myself. But as I've watched the first three seasons over again, I remembered how much different that initial viewing of "Born Under a Bad Sign" would have been had I not seen the promo photos beforehand. You know, the ones with Sam's black eyes? 2. "Hello, this is Jared Padalecki." Remember the ABC Sunday Night Movie bumper? Seeing that (and hearing the music) always brought a sense of excitement and anticipation. Now I get that from hearing Jared or Jensen tell us they're coming up next. I have the entire 42 minutes of show ahead of me, and it could bring anything--laughter, tears, heartbreak, action...and BOBBY! 3. Taking up where we left off. Some shows jump ahead every season, most frequently, I think, so the time frame matches the real-life time frame. Season 4 did that, though it also, of course, fit the storyline and not just convenience. But like season 2 began immediately after the semi crash, season 5 should begin in the room with Sam and Dean as Lucifer approaches. I get shivers just thinking about it. The CW has begun promoting the show, and it's looking good! And finally, we got an actual promo. This is only 20 seconds long. It's kind of propaganda-style, with images NOT from the show interspersed with almost-too-quick-to-figure-out flashes from early episodes. Some of those are very creepy. I'm adding a SPOILER WARNING to the comments because we might want to dissect some of this stuff in there. In the meantime, I'm holding my breath until September 10th! Okay, so a DeLorean won't replace the Metallicar anytime soon, but Eric Kripke has said we can expect a futuristic peek in Season 5. That's right, somehow, someway, Dean travels five years into the future--2014--to a post-apocalyptic world. And it ain't pretty. “It’s our version of 28 DAYS LATER,” Kripke says. The world has been ravaged by war and the crotoan virus. If you don't remember, croatoan was introduced to us in Season 2, episode 9 when Sam and Dean discovered a town where the inhabitants were infected with a blood-borne demonic virus that drives its victims to violent extremes. Hmm, Lucifer AND croatoan let loose. Yikes! Plus, wasn't 28 Day Later considered a zombie movie? I'm scared silly and immensely curious. Me thinks that Dean and Sam are probably not the same Winchesters we love so dearly. Any predictions for what 5 years down the line looks like? I thought I’d write about the Colt, a modified Paterson pistol (named for the city in NJ where it was manufactured) which plays such an integral part to Supernatural. It bothers me that in John’s speech introducing the gun, he said it was made in 1835 the night those men died at the Alamo. Dude, the Battle of the Alamo was 1836. (Jared should have known that, native San Antonian that he is.) There was a battle in 1835 but not nearly as bloody. It lasted for five days, not one night. Anyway, I started wondering about Samuel Colt, this real person who the Winchesters credit with all this occult knowledge. So I googled. Yes, I googled. If I’d thought about writing this, you know, before Sunday, I might have hit the library. He took out his first patent in 1835, when he was only 21. He had to close his gun plant in 1842 because he couldn’t sell the Army on the necessity of his guns. They did use them for the Seminole Indian wars, though. In 1846, he got an order for more guns and had to rebuild a factory using an assembly line. He never fired a gun at another person. He helped develop underground telegraph lines and underwater explosives that could be detonated by remote control. He died at the age of 47, in 1862. So....not absolutely sure of my history here, but I don’t think Wyoming had a lot of railroads by the time he died. We're going to be starting a new regular feature here on Supernatural Sisters, a compilation of the latest news (with links) about our favorite show, the actors, pretty much anything related to Supernatural. Though Friday isn't going to be our regular day, I thought I'd give you a taste of things to come. And if you all hear any juicy gossip, see any fabulous new images, etc., let one of us know. Evidently, Paris Hilton is going to be appearing on a Supernatural episode this season. Wait, before you cry in agony, let it be known that it actually sounds like it'll be funny. She's playing a demonic creature that takes the form of...wait for it...Paris Hilton! Still sad you weren't at Comic-Con this year? Well here's a little taste -- clips from the panel made up of Eric Kripke, Ben Edlund, Sera Gamble, Misha Collins and Jim Beaver. These are some funny talented people, and I was happy to hear Kripke say that this upcoming season will be the most optimistic yet, with the boys coming back together, though slowing and not without angst. Kripke, Edlund and Gamble talk about Season 5 (and possibly beyond), and we get a glimpse of what's in store for Castiel this season in this article. Have I mentioned I love Castiel? And if you're not following Misha on Twitter, do. He's hysterical. ETA: This is just too funny, I had to add it. Tanya posted Monday about the Trickster, and now guess what? Last night Richard Speight Jr. announced on his Facebook (if that doesn't take you right to the update, find his page, then click "updates" on the left side) that the Trickster will be back! I, for one, am very excited! 1. They never get gas at a commercial gas station--it's always back roads and rusty pumps. 2. I get queasy when they buy or eat convenience store food. 3. I have never in my life seen such motel/hotel rooms. The latter has become a hallmark of the show, with even behind-the-scenes vids done on the topic. Suzanne at SciFi Chicks did one in June, and just yesterday I found Alice Jester at Winchester Family Business did this just last week. Honest, I claimed this topic weeks ago! I stumbled across her posts last night while reading her excellent Comic-Con reports. You should check those out, too. It's funny how similar their lists are! They break down the details of the rooms, and are much more knowledgeable and observant than I am. You can find Alice's posts here, here, and here. Now, I always stay in chain hotels, and they all look pretty much the same. Ugly polyester comforters, bland art on bland walls, blocky laminate furniture. When I go to conferences, I get to stay in nicer hotels that still look exactly the same, just with nicer bedclothes and better carpeting. So I figure I just haven't had the right experience to be able to buy in to the imaginations of the set crew. The motels (outside access to the rooms) are almost always themed (hunting cabin, disco, beer homage) and always have those weird room dividers with starbursts or fish or silhouettes of women like on truck mudflaps--or beer bottles. The hotels (inside access) are generally efficiency style, huge rooms that are almost like studio apartments, in old buildings with high ceilings and kitchenettes. There is an occasional "typical" room that feels a little more on the generic side, but usually we have psychedelic wallpaper at the very least. Obviously, the set builders and dressers have a blast creating these rooms, finding props for them, etc. But in the context of the show, how do Sam and Dean find such places? Do you think they look for the cheapest location near the hunt and it always winds up like this? So, what's your favorite Supernatural motel? Thanks to oxoniensis for the screencaps. Anyway, the "Tall Tales" Trickster was sort of a vigilante with a warped sense of humor. He'd been sending people to creative (tabloid-inspired) demise in various nutty ways (okay, not so much demise in one case as alien probing. Which I will also not be using as a post label.) The Trickster was meting out justice to people who were jerks. He was taking them down a notch. Once Bobby clued in the frustrated brothers to what they were dealing with, they killed the Trickster. Except, of course, that it was a trick, leaving him free to pop up again in one of my favorite season 3 ep's "Mystery Spot." If you're any kind of Supernatural fan at all, you probably already know that "Mystery Spot" was Show's take on Groundhog Day, with Sam reliving endlessly the worst day of his life (the day Dean dies--via gunshot, car accident, electrocution, taco poisoning. Piano. Dog. Take your pick.) Hundreds of repeated "Tuesdays" into the episode, Sam realizes that he's dealing with a Trickster (who lured the boys to the Spot by sending a self-important jerk through a dimensional wormhole). Trickster's with their godlike power have the ability to completely screw up reality, subjecting Sam to this gruesome (albeit, in some cases, LMAO funny) loop. Some of the lore descriptions I read on Tricksters said that they were alternately (and often randomly) cruel and kind. They'll aid you one day and set you up for disaster the next. So, while the Trickster was obviously having fun at poor Sammy's expense, my question is, do you think it was completely cruel or that he had an actually helpful lesson buried within the Asia-laden madness? Because he tells Sam that the brothers are each other's weakness, which we've seen demons exploit over and over. And it seems like the Winchesters just don't get it. Dean almost died, and his father sold his soul to save him. Then Sam died, and Dean sold his soul. And you just know that if Sam could have got the Crossroads demon to alter the contract, he would have done the same damn thing to get Dean back. A vicious cycle. Won't they ever learn? Of course, my big question is: do you think we'll see the Trickster again? The episode opens with the boys on a hunt for a monster that can only be killed by electricity. Children are in danger, and the boys find them in the basement of a house. Sam escorts them to safety while Dean stays behind to zap the monster. Unfortunately, he’s standing in a puddle and electrocutes himself, damaging his heart. In the hospital, the doctor tells a distraught Sam that Dean can’t be helped and he’s going to die. Dean, of course, is cracking wise about daytime TV and fabric softener teddy bears, while Sam is frantic to find a way to save him. Dean leaves the hospital AMA and shows up at the motel, declaring he’s not dying in a hospital where the nurses aren’t even hot. Sam has found a specialist, he says, and takes Dean to a muddy field in the middle of nowhere where an evangelist has set up a tent for faith healing services. 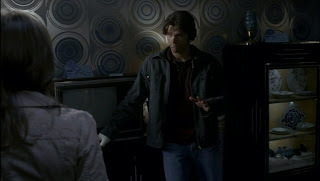 Dean swears that Sam has lost his mind but agrees to appease his little brother. He meets Layla outside the tent, and manages to flirt despite being deathly ill.
Against all odds, Dean is called to be healed. He resists, but Sam convinces him. When the preacher lays his hands on Dean, Dean sees a man in a suit standing nearby. 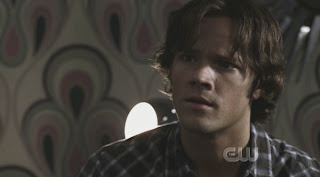 Instantly he feels better, but is disturbed by the miracle, especially when he learns Sam didn’t see the suited dude. Then the doctor who checks Dean out and gives him a clean bill of health happens to mention that a healthy young man died of a heart attack the day before. 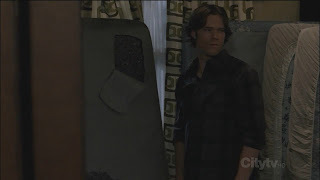 Dean convinces Sam to check it out and they learn that somehow lives are being swapped for lives. It turns out the preacher’s wife has managed to control a reaper. Worse, she is choosing who lives and dies based on their beliefs. What I love about this episode, besides Sam’s desperation to save his brother, is Dean’s dilemma. He becomes attached to Layla, who has faith and is suffering from a brain tumor. Once he learns about the reaper, he can’t allow Layla to be healed, no matter how he cares for her. He can’t let the preacher’s wife take another life in exchange for Layla’s. I really love how this choice tears Dean up, especially when her mother asks why he deserves to be healed and Layla doesn’t, playing on Dean’s already low sense of self-worth. In the end, they can’t save everyone. They destroy the bond to the reaper just as Layla is about to be healed. But she comes to Dean in one of the most poignant scenes in the series. She’s so serene, he can’t help but offer the only thing he has left. Where is this episode in your list of favorites? What were your favorite bits? A few weeks back, I announced a fan fiction contest here. Alas, we got zero entries. :( But I'm still curious how people think Season 5 will open. Part of me thinks it'll start just where Season 4 left off. That we'll see Lucifer actually rising. But how many of us could have predicted how Season 4 opened with Dean clawing his way out of a grave in the middle of nowhere. If we don't start this upcoming season in that same room with Lucifer rising, how do you think the first scene of the first episode will go? Will it be just after the rising? Will Dean be knocked out on the floor and Sam disappeared along with Lucifer? Will it be weeks later and the boys are on the road looking for Lucifer who somehow gave him the slip? Only 37 days until we know for sure, but for now let's pretend we're Kripke. How would you start the next season? How likely do you think that's how it actually will start? Remember, the name of the episode is "Sympathy for the Devil." Come on, peeps. Let's have a lot of ideas tossed out today. It'll be interesting to see who is closest to the actual.